This talk is co-sponsored by the UBC Migration Research Excellence Cluster. Abstract – What citizens think about Muslim immigrants is of great importance for some of the most pressing challenges facing Western democracies. To advance our understanding of what “Islamophobia” really is – i.e. whether it is a dislike based on immigrants’ ethnic background, their religious identity or their specific religious behaviour –Marc Helbling and Richard Traunmüller fielded a representative online survey experiment in the UK in the summer of 2015. Their results suggest that Muslims are not per se viewed more negatively than Christian immigrants. Instead, Helbling and Traunmüller provide evidence that citizens’ uneasiness with Muslim immigration is first and foremost the result of a rejection of fundamentalist forms of religiosity. This suggests that common explanations, which are based on simple dichotomies between liberal supporters and conservative critics of immigration need to be re-evaluated. While the politically left and culturally liberal have more positive attitudes towards immigrants than right leaning and conservatives, they are also far more critical towards religious groups. Helbling and Traunmüller conclude that a large part of the current political controversy over Muslim immigration has to do with this double opposition. Importantly, the current political conflict over Muslim immigration is not so much about immigrants versus natives or even Muslim versus Christians as it is about political liberalism versus religious fundamentalism. 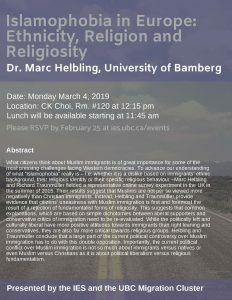 Bio – Marc Helbling is a Professor in political sociology at the Department of Political Science at the University of Bamberg and a Research Fellow at the WZB Berlin Social Science Center where he has previously been head of the Emmy-Noether research group ‘Immigration Policies in Comparison’ (IMPIC). He works on immigration and citizenship policies, nationalism, national identities, xenophobia/islamophobia, and right-wing populism. His research was awarded the Young Scholar Research Award from the Mayor of Berlin, the Best Article Award (Honorable Mention) by APSA’s Section on Migration and Citizenship and the Best Paper Award by the Immigration Research Network of the Council for European Studies. He has also received a Fernand Braudel Fellowship at EUI and an ARC Distinguished Visiting Fellowship at CUNY.